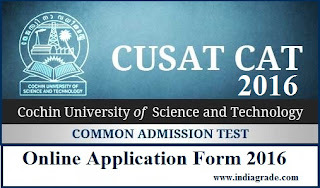 CUSAT CAT 2016 Application Form: Cochin University of Science and Technology (CUSAT) has announced the notification about the Common Admission Test for the academic year 2016-2017. Applications are invited from eligible candidates for admission to various academic programmes of the University such as B.Tech, Integrated M.Sc in Photonics, BBA LLB (Hons) and B.Com LLB (Hons). For (A)(B) & (C) Courses: Pass in 12th class or equivalent with maths, physics and chemistry and minimum 50% marks in Maths & 50% marks in mathematics, physics and chemistry. For Course (D): Pass in 10+2 class with 60% marks in maths, physics and chemistry and minimum 55% marks in maths. For Course (E): Pass in 10+2 class with 60% marks in maths, physics and chemistry and minimum 50% marks in maths. For Course (F): Pass in 12th class with 50% marks in maths, physics and chemistry and minimum 50% marks in maths. For Course (G) & (H): Pass in Plus 2 examination with 60% marks in Science or Commerce group or 55% marks in Arts / Humanities. Candidates should read the notification in the official website clearly before applying for the CUSAT CAT 2016 Application Form. The process of Online Application Form consists of three stages. Then a user name and password will sent to your registered mobile number and E-mail address. Stage-II: Candidate should login into the website using password & user name and you should change your password. Now you should give the remaining details in the CUSAT CAT Online Registration Form. You need to upload the passport size photograph (3.5 cm x 4.5 cm with the file size between 4KB - 100 KB) and signature (3.5 cm x 1.5 cm with file size between 1 KB - 30 KB). Check all the details in the filled CUSAT CAT Online Application Form 2016 before submission. Stage-III: Finally you should pay the Application Fee by SBI Internet Banking, Credit / Debit Card and E-Challan and note down the transaction number for future use. Candidates are advised to don't send the printout copy of the Online CUSAT CAT Application Form 2016 to the University.